At The Fat Duck, what Heston is essentially trying to do is recreate this restaurant experience with food. When he opened The Fat Duck it was in fact his first paid job, and quite surprisingly he is a self taught chef (with a few exceptions as he has worked a short time for two other chefs). He even helped out when they were renovating the house were The Fat Duck was to be located. Quite amusingly he told about a lady who lived nearby. She let him know that “We’ve had 5 owners in 3 years. We’ve closed closed them all down. We’re gonna close you down as well!“. And even the city council wrote a letter, letting Heston know that they felt the name “Fat Duck” was not suitable – they were afraid people might mix up the F and the D.
GB: Culinary experience is emotions for you? HB: Yes. Think about your most memorable meal. The food was good, but probably it was the whole setting. Never forget the fact that eating is about gathering together around a table. GB: What is food pairing for you? HB: Taste happens in the mouth, aroma is picked up by the nose and in our brain this is all combined. Flavor actually happens in the brain. You can compare it with watching a movie at a cinema. You see the picture and hear the sound – and then it’s all combined in the brain. An important point is that this is the most exciting time in gastronomy ever. There is a openness among chefs. And I think everyone has a duty to give something back to the rest of the community. A couple of years ago I bougth the VCF package. I checked up mandarin and found that it contained neryl acetate, which could also be found in bergamot, ginger, eucalyptus and chocolate. This compound in pure form smelled a little like all of them, and from here I could start creating a dish. Food pairing is a catalyst for creativity. Being questioned about his intereste in psychology Heston mentioned a study where the sound of chewing was recored and played back with a 0.5 s time delay to the person chewing. This makes it very difficult to chew normally, and by adjusting the volume down one can make crisps taste stale. Inspired by this Heston got the idea to use sound in combination with a dish (and he actually serves a dish which is accompanied by “sounds of the sea” on an ipod which is served together with the food). 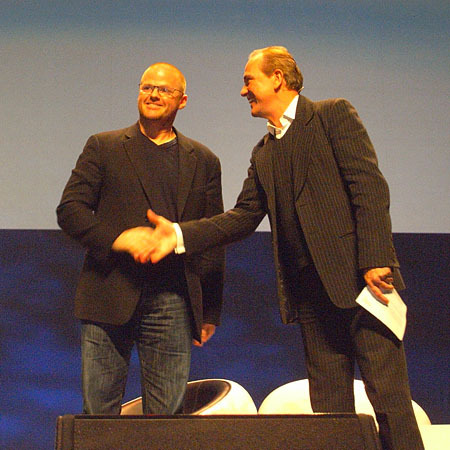 Apart from the contact with Peter Barham, Heston has worked with a great number of scientists including Charles Spence (“eating with head phones” experiments), Andy Taylor, Don Mottram and Margot Gosney. He even recently co-authored a scientific paper on differences of umami taste in flesh and pulp of tomates and holds a honorary doctorate at the University of Reading. That’s quite uncommon for a self taught chef, not to mention his OBE! It is also worth mentioning that Heston co-sponsored Rachel Edwards-Stuart’s PhD on methyl cellulose (video interview). Today The Fat Duck has it’s own development kitchen. I had a short talk with Kyle Connaughton who is in charge of this and he let me know that they are 6 people and that some of these have a science background. 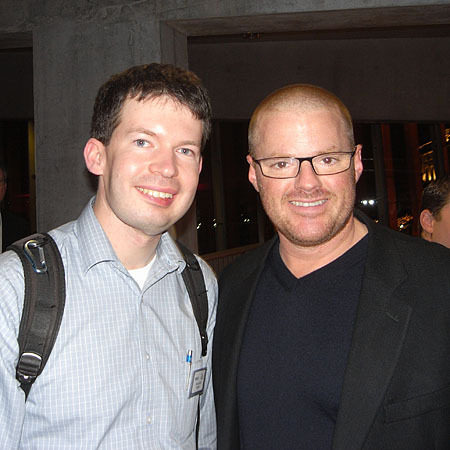 Apart from science and psychology, Heston is also interested in how the arts can be used. He has for instance worked with a magician and he hopes to include something inspired by this in the menu. He imagines that it would be very amusing to ask the guests if they want still or sparkling water, and then be able to serve both from the same bottle. And he hopes to create a menu one day in co-operation with someone who writes movie scripts. In response to people who feel Heston’s cooking relies to much on technology he gave several examples of “normal” kitchen devices which were also new and exotic at some point in time. When electricity first came it was ground breaking, and a lemon juicer made out of glas has also been novel at some point. 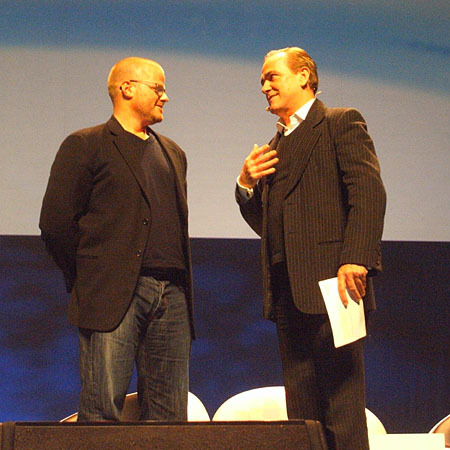 Heston feels that lab grade equipment should be embraced like all the other technologies and techniques that have entered the kitchen. The important thing is what you do with the technology. BL: How will flavor pairing evolve? HB: As more people do it, it will start to snowball. It’s also a confidence issue. You need confidence to be adventureous! Last one was held in 2004. You can find a list of them at http://khymos.org/institutions.php. I doubt there will ever be a new conference in Erice in the same format – the number of participants was limited to about 35! Hmm – very interesting… Thanks!